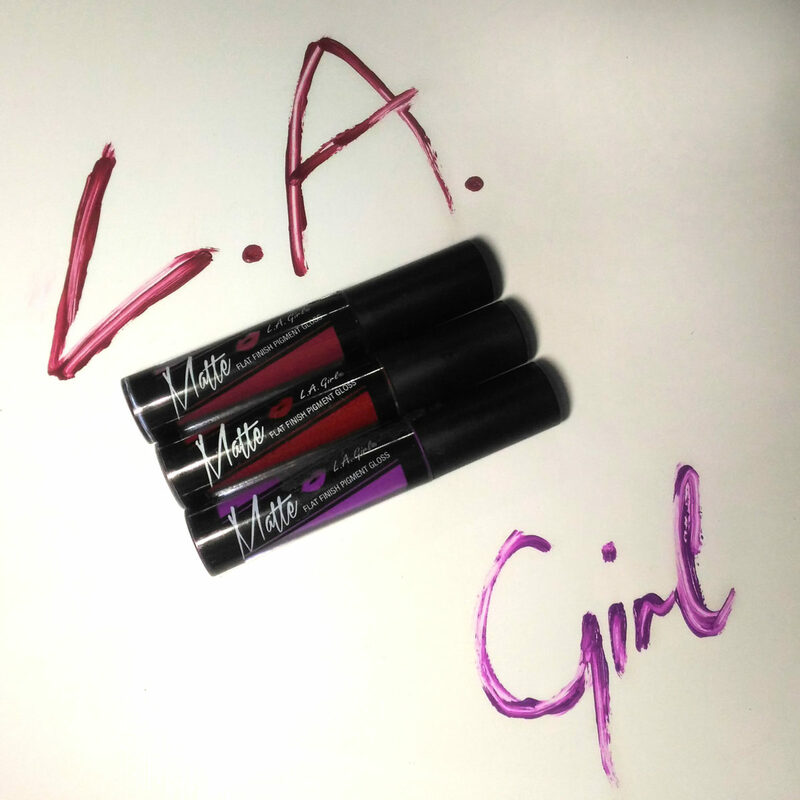 The LA Girl Matte Flat Finish Pigment Gloss (What a mouthful!) is not a new product. In fact, it has gained a lot of popularity since liquid lipsticks became a trend. I’m pretty sure most liquid lipstick lovers have a couple of these in their stash. 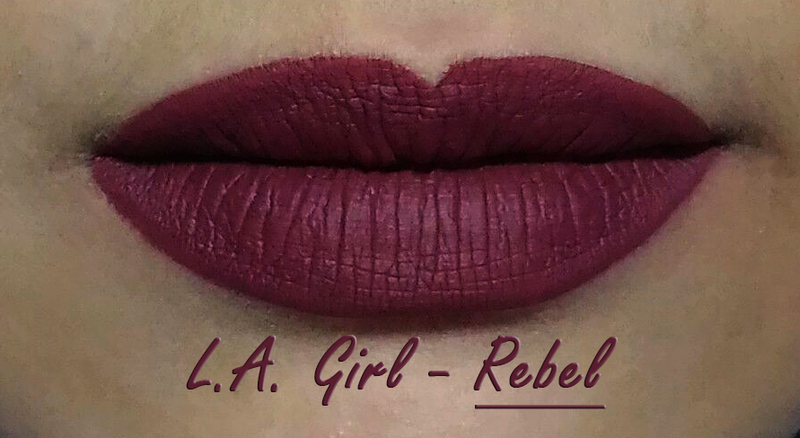 It is one of the most affordable liquid lipsticks in the market, after all. I have the shades Rebel, Secret, and Stunner. 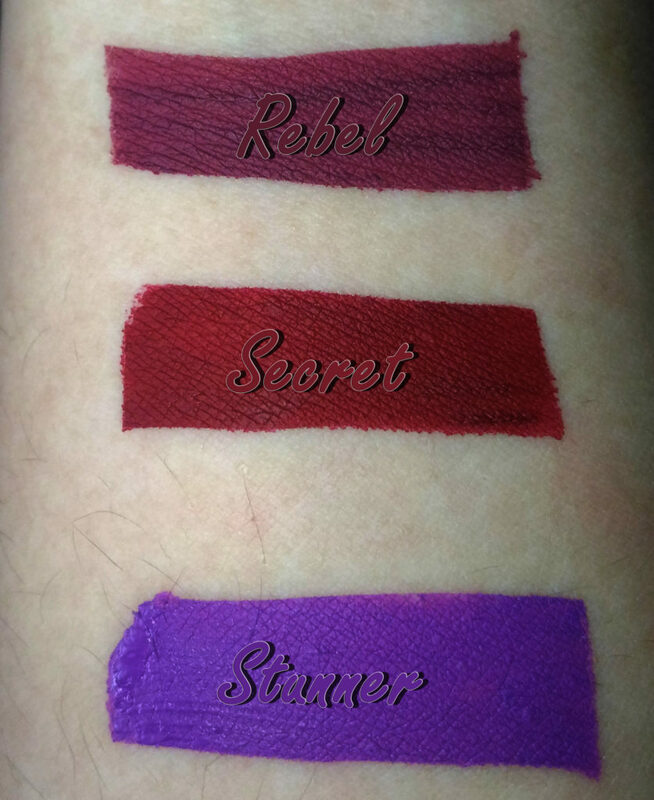 Rebel is a unique blend of purple and maroon. I instantly fell in love with this shade when I first saw swatches online. So far, I do not own a colour quite like it in my stash. It’s definitely bold and borderline vampy. 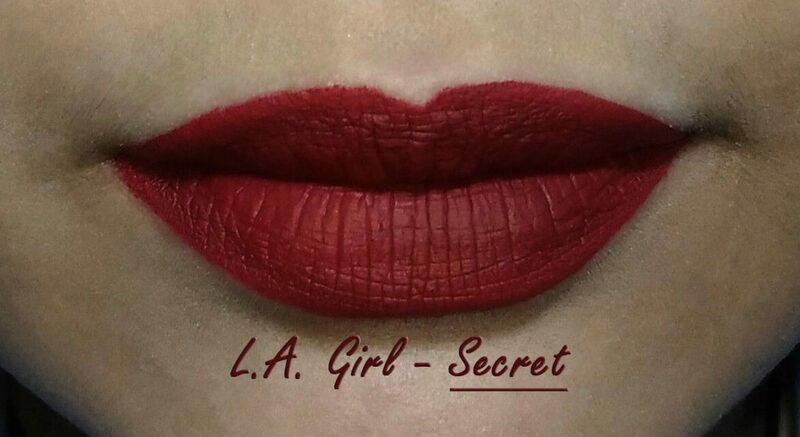 Secret is a deep oxblood red. Some reviews say that this shade goes on patchy; but, for me, it applies evenly. 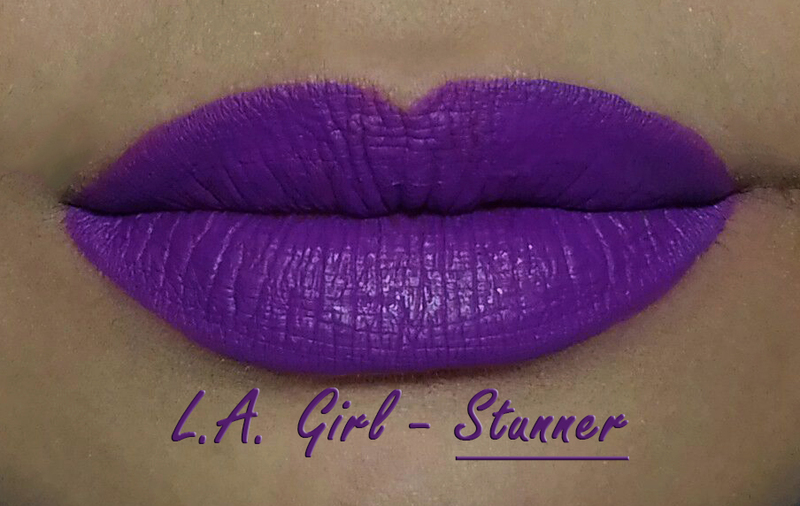 Stunner is bright purple that is not for the faint of heart! It is definitely not an easy shade to pull off. I like how the shade exists, though. This particular shade goes on a little streaky and uneven. Applying a second layer helps to even it all out. The consistency of these is neither runny nor thick. It’s somewhere in between, I would say. It’s still fluid enough to be a liquid lipstick and it is not creamy enough to be considered a lip cream or lip mousse. The pigmentation is a hit or miss, sadly. The lightest shades are chalky an streaky while the darkest shades are uneven, streaky, and do not layer well (layering the dark shades will just rub off the first layer). The “miss” shades are not buildable. Most of them have a nice consistency and opaque pigmentation, though. Rebel and Secret both apply smoothly in just one layer. The finish is very matte indeed. I question why the word “Gloss” is in the product name because it is void of any shine. The texture is not the best, but also not the worst. It has some tackiness to it which can easily be fixed with a light dusting of translucent/colourless powder. It holds up very well through a meal, except when the food is really oily. It doesn’t flake off or crumble even when you press your lips together. It is not exactly “weightless” on the lips. At the same time, it is not terribly heavy. Removal is a bit of a pain if you don’t know how to remove it properly. It is advisable to use an oil based makeup remover to take it off. Personally, I use coconut oil. Overall, I recommend this product to people who want affordable, good quality liquid lipsticks. I wouldn’t recommend the lightest and darkest shades, though. Other than that, it’s a really good product. Would I repurchase? If they release new shades, I don’t see why not. However, I would rather invest in better liquid lipsticks in the market.